One of the things that I have discovered that very few people are neutral on is the image of Christ seated in Judgment on the apse wall of the Basilica of the National Shrine of the Immaculate Conception in Washington, DC. (See photo at right). People either love it or hate it. Those who hate it say he looks angry and many don’t care for the Roman toga and bare shoulder and right chest. To still others, who prefer more inclusive depictions of Christ, his blond hair, blue eyes and exceptionally white skin make him seem too European. Those who love the image say they like the fact that Christ is presented as strong and formidable. For them this image is a relief from many other modern portraits of Christ which present him as a thin, willow-wisp of a man with a kind of “Mister Rogers” demeanor and a goofy look on his face. But this Christ is someone who is to be taken seriously and to whom we must render an account. 1. Flames of Fire in the Halo – The New Testament Scriptures indicate that Christ will judge the world by fire (cf 1 Cor 3:13; Heb 10:27; 2 Peter 3:7-12). Christ is clearly seated in judgment and he will judge the world by fire and also purify those who are to be saved through fire (cf 1 Cor 3:13-15; Malachi 3:3). Further, Both Daniel and the Book of Revelation speak of fire and flashes of lightning around the Throne of God. So it is that these flames indicate the Holiness of Christ and the fact that he will both judge and purify through fire. This fire need not be understood as a physical fire but at least as a spiritual fire. 2, His Angry (?) Look – Many who observe the image say Christ looks angry. At one level this seem likely since on the Day of Judgment there is not going to be any fooling around. The Scriptures speak of this day as a Day of Wrath (Mat 3:7; John 3:36; Rom 1:18; Rom 2:8; Rom 5:9; Col 3:6; 1 Thess 1:10; Rev 6:16; Rev 11:18, inter al) at least it will be so for those who have rejected God’s offer and have not been saved from the wrath. 3. What of his other facial features? – The artist seems to have captured the fact that the Book of Revelation described the glorified Christ as having hair like wool but notice what it says of the color: His head and hair were white like wool, as white as snow (Rev 1:14). Perhaps the artist thought snow white hair would be too shocking but we definitely have blond hair here. The eyes look to be blue or possibly green. Here too our artist has not conformed as well to the description in the Book of Revelation which says, his eyes were like blazing fire (Rev 1:14). This too would be hard to depict artistically. It might look like Jesus had red eye! But perhaps then brown eyes might have been favored over blue since, at least in our age, some inclusivity is desirable in art. Add the blond hair and blues eyes to his white complexion and we clearly have a European Christ. There is only a vague and account of the complexion of Christ in the Scripture: His face was like the sun shining in all its brilliance….His feet were like bronze glowing in a furnace (Rev 1:15-16) These texts speak more of brightness than color. I know that this notion of inclusivity drives some people crazy who prefer color blind society and it would be a joy to get there. But we cannot simply ignore these as factors why some do not like this image of Christ. The Bible’s silence on the skin color of Christ demonstrates that our issues with skin color were not issues pertinent to Scriptural times. 4. What of his red garment?– In Revelation 19 Christ appears riding a strong white horse and John speaks of the robe he wore: He is dressed in a robe dipped in blood, and his name is the Word of God (Rev 19:13). 5. What of his right arm being bared? : Here too I am mindful of a scripture which says, The LORD will lay bare his holy arm in the sight of all the nations, and all the ends of the earth will see the saving power of our God (Is 52:10) It is a symbol of his strength and his power to save and put down his enemies. 6. What of the fact that He is seated? As we have noted this is a depiction of the Last Judgment. And of that judgment scripture says, When the Son of Man comes in his glory, and all the angels with him, he will sit on his throne in heavenly glory. All the nations will be gathered before him, and he will separate the people one from another as a shepherd separates the sheep from the goats. He will put the sheep on his right and the goats on his left. (Matt 25:41-43) I am mindful of the old Latin Hymn Dies Irae which says poetically: When the Judge his seat attaineth, and each hidden deed arraigneth, nothing unavenged remaineth. 7. What of the angels at his feet? In the Book of Ezekiel (1:4-21 and 10:1-22), there is a vision of the four living creatures or Cherubim around a throne, each having four faces, four wings, the stature of a man, four sides, the hands of a man, the soles of a calf. Further, we have already seen that when the Lord returns he will be accompanied by his angels. Finally Psalm 99 says, The LORD reigns, let the nations tremble; he sits enthroned between the cherubim, let the earth shake. Great is the LORD in Zion; he is exalted over all the nations (Ps 99:1-2) Somebody say Amen! I expect some of you will have things to add, possibly some corrections or different interpretations. Remember it’s art not science. One interpretation doesn’t necessarily preclude another. Especially valued are additions to the list that would include insights from Scripture, Tradition and/or techniques of iconography. When we’re done I’ll update the post to include things you might be able to add or clarify. By the way, I am grateful to Jem Sullivan who has just authored a book called The Beauty of Faith. Using Christian Art to Spread the Good News. In it she encourages what I have tried to do here. Namely that we should carefully study and pray Christian Art as a kind of lectio divina before the painted or sculpted word. Here’s a brief video (with a silly beginning showing some other views of the Basilica. Info Hunters ep 1.02 – The National Shrine from KG on Vimeo. As a CUA law grad, I can say that, while I did not exactly hate it, I certainly am not in love with it, with either the look or the pose. It would have been nice to have had something better. And, oh, I don’t know, maybe something related to, say . . . the Immaculate Conception?? Surely Jesus deserves a prominent spot, but it is a Marian basilica! Maybe something with them together? Now, I’m not exactly sure how you could depict the IC in art, and maybe the Annunciation would just confuse people even more into thinking the IC is about the virginal conception of Jesus, but something. Something from Revelation maybe? Maybe our Lady of Lourdes, who said “I am the Immaculate Conception”? Something that seems to display Mary prominently, but is done so that it draws the eye from her toward Jesus, like that icon I saw of the Madonna and Child a few months back? I don’t know why the full picture of salvation must be so offensive, nor yet why they chose the Judgment for the apse mosaic, but if you go down to the Crypt Church you’ll see another depiction of the seated Christ, this one not so imposing. Yes. Both you and Bender have sparked a question as to why this theme was chosen for the Apse. One of our commentors links it to the end of the WWII. I will ask around and try to determine the history. By the way I love the video and have used it on this blog before. It may be time to resurrect it! Yes Re:Bender, I know the Basilica is filled with chapels, mosaics, statues, etc. of Mary. That’s not the question. The question is why this particular spot, the most prominent in the building, does not include her. Given that the church is of the Immaculate Conception. Therefore, the altarpiece/most prominent image should be of the Immaculate Conception. …then can we ever have a Christ-in-Judgment as the most prominent image? I mean, is there a Church of the Last Judgment somewhere? Or a Shrine of Judgment Day? Or a Basilica of Christ-in-Judgment? Is that Mary up there? That tiny thing that one can hardly see (especially since the baldacchino is itself set so far back – but don’t get me started on that particular architectural feature)? As for the other point, I’m sure that there is likely a Christ the Judge church somewhere. And it certainly is the dominant feature of the Sistine Chapel (which has Mary right next to Christ at the Last Judgment). The first time I ever saw this was at LOL Saints; I didn’t like it then and I don’t like it now. It gives me the creeps. That’s a good thing. It should cause fear and discomfort in you. The last judgment is going to be a scary time and an image of Christ at the last judgment shouldn’t be comforting, it should depict someone who means business. When I visit the Shrine of the Immaculate Conception, I am always an awe with the Sacred Arts, Sculptures, the marble, granted, stone carvings and the list goes on. It connects me with my catholic families all over the world. Of all the stain glass, and mosaics. I just could not figure out how this mosaic made it center and front of the most important center of the Basilica. I could make no sense of it. I know it represent Christ, and I did conclude that it was Christ on a throne. I just could not get past the Muscles and the built chest. I always view Jesus as a serene man, although I learn he had a temper and show anger, but a body like this I could not fathom. My first impression was uh, Jesus has really been working out! My view of this mosaic will never be the same. This is amazing art. I can clearly see all you revealed. What do you think about the bristles on his face, does that help to see endurance? I adore the how scripture and sculpture reveals Gods present in everything we do and see relating to the True Church, Thank you Father for choosing me to this faith, and thank you monsignor for bring out faith alive! It would be great to see a post of pictures of Holy Comforter St Cypian Church and how scripture comes alive though its art. Never really considered the beard except that the beard on a typical Jew from Jesus’ time would likely have been thicker. Nevertheless I agree the beard indicates strength and manhood. I like his masculine face. It reminds me of His Manhood and Messiahship, which so many “cool” people try to imitate but fall short because they don’t have the humility and simplicity of Christ. It seems to me that the reason the mosaic comes across as weird is the proportion of the eyes to the rest of the face. Is there a reason the artist chose to make the eyes oversized? Much iconography looks weird to the western eye because it is not trying to portray physical beauty as much as theological beauty. I will admit, I am more western in my artistic taste. I have been to the Basilica many times and have never acquired a taste for the icon. However, I now have a better intellectual appreciation for it. I would agree with Bender though, shouldn’t there be an image of Mary there? Hmm, I ahve never thought of the eyes as out of proportion. I guess they are a little big. But I like your observation about theological beauty. To paint Christ with feminine looks, is not right. In this case This Christ is authentic depiction of Him. Awesome, powerful, unafraid, majestic. It should give the creeps. He has come to us to bring us fire. To the look worm, He said that He will “vomit”. You project authentic power, if you have paid the price for that power. You Christ have gone to the cruz, and shade your blood. I understand your reed garments. I see you wounds. We love Mary, because She is, His mother. He is the Lord of Life. He gives sense to everything. In this case, the display of love for Mary in all the depictions at The national shrine, This Christ gives sense to all. At the same time we can not forget that ….CHRIST, is Merciful, slow to anger, compassionate Father, that will leave every thing in search of his lost children. To me this is inspiring. I have no problem with the masculinity thing – I doubt Jesus was a wimp and in fact, as a carpenter He was probably pretty buff. But this guy is just scary, and while I also have no problem with different skin/eye color depictions, He just looks like a pissed off Viking – not righteously angry, but ticked. Did you people not know that the church should be a place of prayer? When Jesus was asked about money-changing in the temple, Jesus (always quoted Isiah) say My Father’s house should be a place of prayer–not hip hop, not judging paintings, not buff Jesus, but a place of prayer. I used to pass a Jewish synogogue in NYC before it was torn down. That was what was inscribed on the outside of the synagogue. Isiah: My house should be a place of prayer. I suppose you people want it to be a rock star stage. Get a grip, It is God the Father, God the Son and God the Holy Spirit you should be worshipping. If you don’t understand that, you are not Catholic nor are you Christian. Wow – what are you so angry about – ??? Sorry, should have replied here. Forgive me. I beg your pardon, my brother in the priesthood. Msgr. Pope: Why do you read “anger” when there is no anger at all but sheer honesty? I am very sorry to see you react this way, borderline disrespect for a brother priest. Even though your article is excellent, however I still believe that the portrayal of Christ the Judge at the Basilica of the Immaculate Conception in Washington, DC looks more like Jupiter/Zeus. God bless you, Msgr. Pope! I apologize if you thought my repsonse was to your comment. It was not. I notice that Mark G thought my repsonse was to you as well. I am not sure how my comment got attributed to you. My reply was addressed to Geisteswissenschaften above who is quite angry at me and many of the commenters here. I am not sure why the comments editor I use with wordpress doesn’t always stick the reply with the specific comment but pastes it at the bottom. The flow of response is obviously confused when that happens. But again Father Gabriel I beg your pardon for the mix up and assure you that the reply was not intended for you in any way. When I posted the comment just above using this comment page rather than my comment editor I notice it did not nest my reply under Fr. Gabriel’s as it should of. Hence there must be something wrong with the comments section of the blog . I’ll have to get the webmaster on it. I noticed Mark G had the smae problem above. Because I don’t like the lambish-looking representation of Christ and because I use a term in common usage to describe “muscular” and because I try to inject a little levity into the conversation, I’m accused of being non-Christian? I’m akin to the money-lenders? I’m glad you are not my judge, Id. If you don’t understand that . . . I guess I don’t understand the point you are trying to make. Or, rather, I understand the point, but I don’t understand how it is relevant here. Are you saying that we should strip out all of the art? That it distracts from authentic prayer? Or that we shouldn’t pay any attention to the actual aesthetic, or lack thereof, of religious art in churches and, instead, get our priorities straight, which is God, not the art? If the latter, isn’t that one of the points of the broader discussion — that good religious art brings us closer to God, that it is conducive to prayer, but bad art, or less than good art, tends to detract from those things? Thus, it should be something to be considered? Thanks for the picture. I was expecting a more Traditional looking Church when I clicked on the image of a Sweedish Church. But the Church is tastefully modern. Nice integration of Marble and painting. The colors all harmonize well. I can’t see the image well but it looks to be from a similar era. Apparently, the original Catholic cathedral in old Gotenburg, St. Joseph’s, was bulldozed in the 70’s to make room for the Norstram (sp?) shopping mall. So the architechture of the new cathedral of Christ the King has more of that groovy 70’s-80’s vibe. Still, the apse mosaic is nice, though a bit dark, including the skin tone. This white-gold haired Christ sits on a rainbow in the midst of a new creation, like a new Garden of Eden. At first, I thought he looked too much like an Asian suami or a Buddha. An interesting touch is the ray of light from Christ’s halo shining through the nail hole in his hand. To my eye, the faint, almost pastel yellow, hues surrounding the mosaic are well-executed but don’t really go with the rich dark colors & gold highlights of the mosaic at teh center. The mosaic’s dark/gold contrast makes it very hard to take a good picture. Still, there’s a lot to take in there. As far as the one at the National Shrine, I appreciate the image of Christ in Judgement, but when I refer to it as “Superman Jesus”, everyone seems to know exactly what I’m refering to. They’re not Notre Dame grads I guess (which, as a Michigan fan, I say is a good thing). I visited the National Shrine for the first time last Pentecost and was stunned how visible this strong image was. I had already visited all the other ‘shrines’ of the capital, those of Lincoln, Jefferson, veterans of various wars, and it made me see how the National Shrine is a shrine to the LIVING GOD; though the shrines of DC are of dead and fallen men, the national shrine holds high the image of Christ Resurrected, beautiful, fantastic. I am glad that Christ is figured in the central dome of the Basilica; while a Marian Shrine it is important to emphasize why she is called Theotokos, Christ-bearer, it is fitting that Christ’s image should be in the ‘womb’ of the structure. I think that the style reflects the art of the time, during that time much art had strong lines, I am thinking of soviet art which exemplified strong jaw lines and muscles for example, but some American artists too had this disposition. Perhaps this Pantokrator is a tribute to that Christ King of The Universe which sits covered beneath tiled mosaics in the dome of the Haggia Sophia in Istanbul; for centuries, believers must have peered up into that magnificent dome and saw the image of the Messiah enthroned, a magnificent image, a victorious image of heaven. Perhaps this was why it was so important to make this mosaic for such an important national shrine. I’ve always loved that mosaic. What has always struck me is the juxtaposition of the stern judge with the mercy of the wounds: He judges our sins, but has paid the penalty for them. As to the absence of Mary in the mosaic: Actually, she’s there, in a funny way. Maybe it’s a function of where I’m usually standing, but it’s hard to look at the mosaic of Christ without also seeing the statue of Mary in front of it. I like the fact that the combination makes Mary look small in comparison to Jesus: the basilica is in her honor, but she always points us away from herself and to Him. I have never really liked this image but you have at least softened my dislike. What I find really disturbing are the angels at Christ’s feet. Look closely at their faces, they all look like enforcers for the mob complete with uni-brow and broken noses. I have long loved this depiction of Christ. I think it is significant that this image of Christ came in the wake of the Holocaust and the millions killed in Communist lands and World War II. Jesus here is the Lion of the Tribe of Judah, who will render justice to those responsible for such crimes. When one thinks seriously of the extent of moral evil in our world, I think it’s necessary and good to recall that God is more powerful than all the evil man can do. In some sense, this is a depiction of Jesus for those who are oppressed and we in the U.S. are not used to thinking of ourselves as needing such a savior. But, at the end of the day, this is an aspect of Christ that is rarely made present to us. In this sense, it is a very important reminder. Yes, And I like your reference to the Lion of the Tribe of Judah. I will look into the Biblical roots further. It’s a bit silly to say that those “who prefer more inclusive depictions of Christ” find his blond hair, blue eyes and white skin too European. Brown eyes are no more inclusive than blue; black hair is no more inclusive than blond. You can’t depict a human being without using a specific eye and hair color, which necessarily excludes all other colors. The real complaint is that this mosaic seems to depict a non-Jewish Jesus, perhaps because the artist considered northern European blond, blue-eyed features to represent ideal beauty. Yes that would be another way of putting it. A Jew of Jesus’ time would have likely had more olive toned skin, dark hair and brown eyes. no, I’m looking at the picture, as you say, and the Jesus in the dome is definitely not serene-looking. In fact, the whole picture looks very “hokie” and that’s my biggest complaint. and yet you have the audacity to speak of ‘strength’, but you say those things in Vanity, and for it, you are no better than the Anglicans or the Muslims or the Jews, who, as groups of people, constantly ask of God to be more like themselves. This mosaic is absurd. He’s all flexing and bulgy and muscl-ie. Remember the Psalms – Trust not in the strength of horses, archers, or chariots. You try to put more human muscles on Jesus Christ as IF that could actually make him stronger???? No. no. no. You misunderstand. You don’t know what you’re saying – even if you ARE a monsignor, whatever the heck that means. Monsignor is the most arrogant ‘title’ that could ever be attributed to a man, anyway. There is nothing humbling about being monsignor – it’s a human title! Christ taught us this – MAKE YOURSELVES SMALL. This image is a blasphemy because it takes the work of the Cross and renders it useless in the minds of people who praise it for its reverent strength. Christ did not conquer HELL because he was so damned strong. NO, Christ conquered hell precisely because he made himself so small and humble, like a little child. Hell cannot contain a small child!!!!! Death does not have that power. The kingdom of heaven is such unto these- that you become as a little child. Make yourself smaller “monsignor” Why be a monsignor when you be so much more saintly! Strip yourself of your robes, be a just a priest. I can tell by the way that you write, and anyone can tell a tree by its fruit, that you haven’t had enough practice being small. I’m not writing this to inflate myself, so I use a moniker instead of my real name, but this letter isn’t just about correcting your wayward interpretations, trying to scandalize the laity, and make them believe there is actually something glorious in this abominable picture of – whoever the damn hell that person is in the mosaic, because whoever it is – It Ain’t Jesus. Blonde hair, blue eyes, rippling muscles, and a Roman toga – you made Jesus look like a homo. Get rid of this unGodly image as quick as you can. Your comment is so ad hominem, hostile and over the top as to make me think you must be joking. Are you? What really makes your humor so masterful is that you argue for us (me) to become more small and humble while at the same time being big and blustering. Ah Geisteswissenschaften you are using the tools of your sociology well! Of course it’s ad hominem! And why not be over the top – look at that monstrosity of Jesus in teh mosaic! Talk about over the top. Lol. But no, I am not joking. That’s because i’m not so much concerned about the image itself. I am concerned about YOU. But remember that even if I float my own ego in order to make you see things differently, to make yourself small – the argument is still valid. even scripture validates it. The only thing that matters is Effect. There are two desired effects I hope for: A) that you not float yourself by simply ‘being’ a monsignor [a most useless (read: Vain) title if ever there was], even if I have to show you how absurd it is by floating myself. B) that people recognize how quite absurd and ‘big and blustering’ this image of a God really is. big-ness of Christ. This flexing queer macho-ness (which Pope Benedict himself railed against) is totally inappropriate. Ich glaube, daß wir ein Atheist unter uns haben. Mindestens, jemand der nicht vom christlichen Glauben ist. Warum hat er(?) Verachtung für Monsignor Pope, wem hat er nie getroffen? Warum muß er vom unserem Glaube Spaß machen? Der Geist, zu welchem sein Pseudonym verweist, is nicht unser Heilige Geist. Ah Cynthia, I kann lessen ein wenig Deutsch und ich kann verstehen sie ein wenig. Thanks for your support. We cannot know of our interlocutor’s faith but his disdain for not only me whom he has never met but also many of the other commentators is strange. Indeed, a whole different mind and spirit! As they say in Germany, “bleibt ist bleibt, nein kumpf für das”. It doesn’t translate directly to english, but the expression is: Stupid is stupid, there is no cure for that. Ou en français, s’il vous plaît! Didn’t you know I speak many languages? Vietnamese, Spanish, and Hongul too. Oh, and I can read the bible in the Koine Greek. But why should I not correct the elevated monsignor if he is wrong? Did not Paul correct Peter, and more so, did he not tell of it later! To the untrained ear, it might have even sounded as if he were bragging. But he was not. Neither was he arrogant about it. How arrogant one must be, though, to try to write an insult in another language. And to place your accusations against me in another language is really a bad idea. In fact, it is utterly unintelligent. I’m far from being an atheist. I’m a living practicing Catholic who was appalled the first time I visited the Cathedral in DC to see that monstrosity of a mosaic, that wretched hideousness by whatever no talent clown put it together. I’m beleaguered by the monsignor’s artistic appeal to its prowess, trying so hard to justify its character in theological values as if art could really appeal to authority. Art must always speak for itself and never demand acceptance based on any appeal to a source other than itself. I am an artist myself, and I philosophize from time to time. I take the argument wherever it must go and let no man (or woman) rest on credentials when appealing to truth. But art is truth. In one fashion or another, art is truth. It truthfully expresses the inner most appeals of mankind, even when those appeals are distorted, perverted and often punctuated. Sometimes, in disgust even, art appeals as a calling out, a cry for a life more worthy of donation. Needless to say, I am no fan of most contemporary art, a lot of what we are calling art is really just design work, having no artistic endeavor to reveal any character of truth, but instead meant to subdue the truth with amazement for sheer tenacity. But the fruit of that little worm is not only a result, but also a cause for, a culture of death, a death that is, of meaningfulness. And then there are occasions, such as what we are beholding even now, where the truth is exchanged for a lie, a deliberate lie. Trying to make Jesus appeal to humanly strength is deceitful. His entire strength is that he indulged himself to make himself small and meek and humble and this is the True image of Christ as a sign for our Catholic faith and that image is being plagiarized by the so-called artist who scandalizes us with this pseudo-Christ. But it is far worse for us to appropriate for ourselves any kind of theological virtue (arete – excellence) deriving from that stain on the ceiling of the Cathedral of the Immaculate Conception in Washington, DC. So, I close as I opened – some things have no cure. But at least for the seven lively virtues and the seven deadly sins, their juxtapositioning imposes in themselves a belief in that good to which we can appeal. It is that one good, it is, in a word – smallness.If you want to imitate Christ Jesus, be as Christ, and do not imitate what you see in the ‘Cathedral’. “Imitate me as I imitate Christ” says St Paul. Well, I’m not always perfect at it, but at least I’m not shrugging it off. Remember – It’s less. It’s more when it’s less. Ah GWS you ought to just chill, it’s just a piece of art. Like it or not de gustibus non disputandem. You are free to disagree with me as to the quality of the art but why be so “disagreeable?” Why the personal attacks. Just chill. Count me in the love-it column! On your next visit to the Shrine, walk completely around the high altar and go stand directly under apse, close as you can to the center far end of the Shrine. Standing there with eyes level, looking back toward the high altar, slowly tilt your head way back so that you are looking straight up at the ceiling. An indescribable visual sensation! One hopes that the “indescribable visual sensation” is not followed by the sensation of landing SPLAT on one’s rear by leaning too far back. Yes, pantocrator is a word I thought of using in the post but forgot. THanks for the term. Love your posts Keep em coming I look forward to more! I love the image! It always reminds me of the End Times and that Jesus is the Lamb of God. Any Catholic Church, irrespective of its status or designation, should have Christ as its center – physically, methaphorically, and every other way. Despite the Shrine’s overt focus on Mary, it is correct that Jesus is portrayed in His majesty. I have greater appreciation of this piece of art now that you have de-mystified the details. Thank you. Oh! I remember my elementary principal Mr. Bulware who had a series of 8(!) paddles on the wall behind his desk, all of varying thicknesses. We actually feared the thinner ones most since they smarted more than the heavier paddles. It was the final days of corporal punishment and I lived to tell about with my little ego intact! Little Girl: Let’s play something. My Daughter: Okay. We can do Principal’s Office. MD: You be the person running in the halls and I’ll be Mr. S.
The other girl’s mom, who knows my daughter well, also was nearby, trying desperately not to howl with laughter. Her: Your daughter seems to have the principal’s-office routine down pat. Me: I would think so. She’s there just about every week. *wail* OTHER little girls play HOUSE. Her: *snurk* Perhaps next year she’ll get down to once a month. I am pleased that as a third-grader my daughter has managed to keep out of the office. It must be all those prayers while I’m at Adoration. 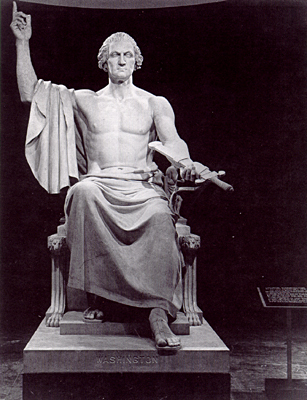 My first thought was how it resembles – and differs from – Horatio Greenough’s 1840 statue of George Washington based on ideas of what the lost statue of Zeus at Olympus by Phidias probably looked like! The bare-chested, draped Washington points to Heaven with his right hand, but is Christ’s gesture here not only displaying his “glorious scars” (to use Wesley’s phrase in the hymn “Lo, He comes…”) but doing so in the traditional ‘orans’ gesture (the Incarnate, Resurrected, Glorified Son glorifying the Father)? The hair and eye color made me think of the little blond, blue-eyed Jewish boy, Immad Cohen, who portayed the young Jesus in Zeffirelli’s ‘Jesus of Nazareth’. Not what one normally thinks of, but simply one of the real possibilities. I don’t understand the three gouts of flame issuing from his head. Could this be a misreading of the Vulgate’s Daniel 7:10, “a facie ejus” (LXX, ἔμπροσθεν αὐτοῦ), “from before him”? If there is no scriptural basis for the three flames then it’s a pretty bold stroke of bravado (juvenile to me at least). And if there is scriptural basis, well, not everything in Scripture is pleasant when depicted (see Bigot’s Judith) or necessarily tasteful to depict (what would be the point of focusing on a dog licking a Lazarus’ sores?). That said, not all medicine is suited to the individual’s taste, and some medicine is bitter to all of us. Sometimes we all have to drink the cup. I am not sure why the three flames are juvenile bravado. Can you elaborate? I only meant that, to my unrefined taste, they seem like the type of thing I would have drawn on a superhero in my notebook (flames issuing symmetrically from the hero’s head) when I was ten or twelve years old. In that respect I think they are juvenile. If they are without scriptural basis, then in that respect bravado. But if they are based on Scripture, then they are simply distasteful to my unrefined artistic palette, like the examples I gave. I actually can’t think of a single thing I DON’T like about the Basilica. Even the saccharine, the over-the-top, the distractingly idiosyncratic themes and qualities of the statues and mosaics I find somehow charmingly American. As an American, even that flame-laser-beam that the Jesus seated in judgment over the western doors seems to be shooting Spider-Man-style, I find somehow charming. We are a liturgically Protestant country, and our religious experience is usually highly emotional. Now that doesn’t suit my personal taste, but neither does my brother’s putting mayonnaise on his fries make me love him any less. More in fact. You just won’t catch me anywhere near a puddle of mayonnaise is all. The Hebrew letter Shin is said to be made up of three flames. In Judaism Shin also stands for the word Shaddai, a name for God. Because of this, a kohen (priest) forms the letter Shin with his hands as he recites the Priestly Blessing. The three flames could thus be a blessing as well as symbol of judgment. I always thought of the image as the whole Trinity. The humanity of the Son, the flames of the Holy Spirit, and the sheer awesomeness of the Father. Great comments from most, here. Thanks for the exposition, Msgr. Yes, thanks for the reminder of how Theotokos applies to this image where it is and prominent! I first saw this when my seminary came to Washington for the March for Life. I started laughing out loud–it looked to me like Zeus over the altar, and I wondered, “what were they thinking?! ?” I appreciate, Msgr. Pope, your explanations of the symbolism in the art. Well sometimes one may not like something but at least it helps to understand what was intended. Thanks for reading! My friends and I always joked that the day abortion is made illegal, we will get a ladder and tape a smile on his face! Might the flames at once recall the traditional ‘Cross-nimbus’ and be an image of the Holy Trinity (like the three-branched candle carried on Holy Saturday by the deacon when he chants the threefold ‘Lumen Christi’)? I assume you have heard the one about The Lord’s appearing to the lady praying at the National Basilica, and asking her “to build a beautiful church on this spot.”…? He doesn’t look like the Christ I have come to know in prayer (and definitely not as good looking as Jim Caviezel!). I have found the art eery and scary at times, and since the Shrine is a common place of pilgrimage, it is too Euro/Caucasian looking. Also, I agree with what others are commenting on how it’s called the Shrine of the IMMACULATE CONCEPTION….I would assume referring to Mary, Mother of God, therefore the major image should be of Mary and Jesus, not a very angry appearing, making you God-fearing (for real) Jesus. On the positive side of the image, I feel like Jesus is staring at me while I’m in the Shrine so I am on my best behavior and in my best clothes for events there. I just tell it like it is so I apologize if I offend anyone…that’s not my intention. I am a Canadian Dominican priest living in Vancouver with my OP brother priests. I have seen the image of Christ seated in Judgment on the apse wall of the Basilica of the National Shrine of the Immaculate Conception twice in the last twenty years while I was in Washington, DC. I must say that I highly dislike it as it makes me think of Zeus/Jupiter rather than Christ in glory or Christ as the eschatological Judge. Besides, true manliness is not to be measured by the size of pectorals and biceps. It is my conviction that the Christian East has been much more successful than the West in depicting Christ as the Lord of creation and the Judge of the universe. So while I can see lots of people having lots of opinions, for my family, it was that image that made all the difference. While I’ll let Dominic’s son Gabriel speak for himself, I didn’t read his comment as hostile at all, but honest. I rather argee with him. Another image of Christ on the Judgement seat (or at least seated in glory) is the apse mosaic at Westminster Cathedral (no, not the Abbey). Seems that people were a bit underwhelmed with that rendition when it was unveiled, so perhaps the overly strong emphasis for the image at our National Shrine was influenced by the earlier weak one at Westminster. I looked for a picture of this on the web but couldn’t find one. Do you know if the image is out there of Christ seated in judgment? You are correct – there are not too many good pictures of it out there, most because the Great Rood hanging in front of it obscures almost every view & is much more captivating. There are a few poor images of the mosaic in Google Images. Even http://www.westminstercathedral.org.uk doesn’t have a good picture of it. Msgr. Langham’s blog Solomon I Have Surpassed Thee was one the best around & had glorious photos of the various aspects of the church, but it’s been decommissioned since the Msgr. was reassigned. There is also a mosaic of Christ enthroned above the door. The book in his hand reads, “Ego sum ostium, per me si introit salvabitur,” if I remember correctly. It’s a really amazing place. So is the National Shrine, too, of course! This is a very interesting article, Msgr. I’ve not been attracted to the image myself, but the explanations behind the imagery is beneficial to my “toleration” of it. As someone else put it earlier, I can now appreciate it at least intellectually. I remember my grandmother once saying (she grew up in the area) that Christ was showing how great the fish (Satan and all the lost souls?) that got away was, and that He was upset … quite the personal interpretation! She has since died … requiescat in pace! As for the focal point of the Shrine, I can’t imagine that the Immaculate Conception would be upset with Christ in Majesty being the main image inside … afterall, there is an image of the Apocalyptic Mary to the left and St. Joseph to the right (under separate domes). By the way, I’ve also “become accustomed to her face” … it helps when you’ve grown up in the area. Amen AJ Glad to help at least in the intellectual dept. I get the impression that all sorts of ‘boldness’ have gone into this image of Christus Deus noster, but in some sense well-thought-out boldness. To take up the topic of ‘musculaturity’: a lot of Eastern icons (from various periods) of the Baptism, the Crucifixion, and the Epitaphios (for example, by Theophanes of Crete) – and, in comparison with the tradition of the latter, for example, Geertgen tot St. Jan’s ‘Man of Sorrows’, are not unmuscular, though not as pointedly muscular as here. It is also an ‘Eastern’ tradition to juxtapose Pantocrator and Ephitaphios. Is it too fanciful to connect the physical strength of Christ in this depiction with the theological and historical truth that “He gave Himself up for the Life of the world” (as the Liturgy of St. John Chrysostom emphasizes)? Thanks David, lots of connections here. Not sure how to anwer your question except to say that there are any number of possibilities, that’s the beauty of art! I haven’t really addressed the Christ mosaic itself. Partly because it has been so long since I’ve been to the National Shrine. When I was at CUA, I went fairly often, and if I remember correctly, what I did not really care for is that it is in too modern a style for me. There is just something about it that says “modern” rather than classical. I don’t know that I’d go so far as to call this Jesus a comic book style, but I don’t think that J’s characterization is that far off either. As far as art goes, I’m more drawn to the Renaissance or Gothic or late Byzantine. understood Bender. It took me a long to overcome my preference for gothic. But as I’ve said, over all these years I’ve grown accustomed to her face. Mother of God, Daughter of the Son. Has there ever been a depiction of, rather than a Madonna and Child, a Resurrected Jesus holding a baby Mary? Sorry: I messed up ‘Epitaphios’ the second time and even worse in attempting to revise ‘musculature’ to ‘muscularity’ (somewhat tangentially, there is a wonderful early-Twelfth-century Georgian icon of the Forty Martyrs of Sebaste in the Svaneti Historical Ethnographic Museum in Mestia, Georgia, in which each of these faithful Roman Legionaries of Legio XII Fulminata is distinct from every other, but all are quite muscular). Another – possibly far-fetched – thought about the flames in connection with the traditional ‘Cross-nimbus’: the Cross-nimbus (in icons) very regularly has a quotation from the Septuagint text of Exodus 3:14 distributed over the parts of the Cross – the definite article ‘ho’ on one, the omega on another, the nu on the third. Could the choice of flames be, among other things, a reference to the fire in the burning bush? Since at least St. Gregory of Nyssa, the Burning Bush has been read as a type of the Blessed Virgin Mary as Theotokos. Is it not possible that this is then a symbolic reference to her, here? Thank you for the link! I had something like this somewhere in the back of my mind (perhaps one or another Great Rood?) but could not picture it and had no good idea how to try to search for it! Before reading your reply yesterday I ran into something interesting in Dante (Paradiso, canto 14, lines 52-57), and afterwards a translation of a Latin ‘private devotion’ related to Isaiah 6:6-7, both of which may be relevant: I will hope to add a comment about them later. I think it would have been magnificent had they made it look like Christ the Pantocrator or perhaps like the large image of Christ in the ‘Church of Our Savior’ in Manhattan NY (as seen on ewtn with Father Rutler). As it stands, i feel no connection with tradition or our Lord when i look at this image. Its too much of a statement about the artist than about Christ. Sorry, but one more critique, His right arm is completely disproportional…. i dont get it. Was that supposed to be a dislocated arm from the cross? While we’re on the subject — while I love St. Matthew’s Cathedral, the statue of Mary just doesn’t do it for me. Every time I see it I think of Fred Astaire or Gene Kelly doing some dancing move. The rest of the Cathedral is beautiful though. Even worse there’s a kinda Scott Joplin look to her pose. I have just joined this thoroughly interesting/intriguing conversation! I took my youngest granddaughter to the Shrine a couple weeks ago for her first visit and I found myself apologizing to my son-in-law for the overpowering (my words) mosaic of Christ. I have not personally been fond of its menacing appearance and European features. My son-in-law is African-American/Swedish so I was curious of his take on this particular depiction of Christ. His graduation was at the Shrine and he said he remembered it as being an “unusual” portrayal of Christ and he too thought it was an angry Christ. As far as the features; he seemed nonplussed as he’s seen mostly European-looking portrayals of Christ his whole life and his father is Swedish with very pale skin and blue eyes so he may be able to identify Christ the Man more with the looks of his own father than most. Msgr Pope, I do appreciate the commentary from you and all the others and will say as some of them have that it has “softened” my viewpoint. I still cannot forget my great disappointment upon entering the Shrine of the Immaculate Conception for the first time and seeing this “Christ in Majesty” rather than a mosaic or painting of either Mary, as Queen of Heaven, or a Madonna and Child. Since the mosaic is obviously there to stay, we must all learn to appreciate it for what it is: a depiction of Christ in all His Majesty. We all have free will and just like with many things, including art, we can choose to reflect and gaze at it for as long as we like or we can review it and move on to other parts of the Shrine that better engage our sense of beauty, faith, devotion,Catholicism, etc. I probably shouldn’t even acknowledge Geisteswissenschaften as it feeds his/her ego but I will, only to say that you obviously don’t have a clue about Msgr (as humble as they come) Charles Pope. And yes Jan, Jim Caviezel portrayed Jesus Christ as close to what I too believe is the most historically correct of any person to play Jesus on film. The radiant soul of Solomon explains to Dante (Paradiso, canto 14, lines 52-57) that, as the living glow of a coal exceeds the light of the flame it gives off, so shall the resurrected flesh exceed the splendor that now swathes each redeemed soul. Perhaps Dante thought of the lesser coals taking fire from the ‘Great Coal’: at any rate, the coal of Isaiah 6:6-7 has long been read as signifying Christ (and the coal-bearing tongs, the Theotokos) – and I ran into a translation of a Seventeenth-century Latin prayer addressing Christ, “O Thou, That Coal of double nature”. I have never been to the Shrine, and so have not seen the image itself. But the gold within the halos/nimbuses (parenthetically, of what is the differentiated double-halo – or concentric halos – significant?) is obviously brighter than the red flames. And, in the posted detail-photo of Christ’s Face, His Flesh looks clearer and (in that sense, at least) brighter than the halo-gold. In the Mystery of the Incarnation (including the Resurrection and Ascension), in the Hypostatic Union from the moment of Virginal Conception, the fullness of Christ’s Human Nature has been taken into the Innermost Life of the Holy Trinity – from Which ultimately proceed all God’s manifestations and communications to His sustained creation. The bright Flesh, immediate nimbus gold, and further reaching red flames might symbolize this Mystery and ‘Economy’. And, with an eye to the Shrine’s dedication, one may observe that Totus Christus was the cause of the salvific preservation of her, more honorable than the Cherubim and incomparably more glorious than the Seraphim, of whose womb He is the Fruit. I think that the Christ in Majesty mosaic is one the best elements of the National Shrine, and I am thankful for the artistry of John De Rosen, who created it. When I walk into the narthex and look down the nave, it inspires a sense of awe, as if I am coming into the throne room of Christ the Eternal King. In terms of images that I have seen of Christ, I cannot recall seeing one that evokes the same degree of majesty and victory. In that respect, I agree, as you stated in your post, that it portrays important dimensions of Christ’s reality that are not as frequently depicted. Here in the capital of the United States, I think provides an imporant reminder that the universe is not a republic or a democracy, but is a benevolent monarchy whose King gives His life for his people so that they can become royal sons and daughters of their Heavenly Father. As has been noted by another responder, it is consistent with the tradition of having a Pantocrator image in the apse of a great church, and theologically it is appropriate that he occupies such a central place as the Blessed Mother’s role in salvation is derivative from Him and points to Him. I think that having an image of the Blessed Mother in the apse would evoke something of which ill-informed Protestants accuse Catholics, namely, that we “worship” her. (Perhaps an image of Mary’s coronation by the Trinity might be appropriate, though). As to this Christ supposedly being angry, I can certainly understand that initial reaction, and righteous anger is a dimension of Christ. However, upon looking closely at his face, it seems that his gaze is more piercing or unconquerable than angry, and I like what you noted in the difference between the two eyes. The integral connection between Christ’s kingship and being the sacrifical Lamb of God is evoked by his pierced hands and blood-red robe. When we think about that, we remember His love. As we Catholics believe that physical matter conveys spiritual realities, his muscularity needs to be understood as symbolizing, as you noted, his “strong right arm” and the spiritual qualities of masculinity. I think that the most valid criticism of this image is that Christ here looks more northern European than Mediterranean/Semitic. I too have long had a love of Gothic architecture, but the National Shrine has really grown on me since I’ve lived in the DC area, and I think I’ve grown to equally appreciate the beauty of the Byzantine/Romanesque style. I have always liked domes, too. Thanks to Stephen’s naming the artist, I have discovered photos of other of his works – capable of providing more food for thought, and (heated) discussion – and also relevant information. I note a couple points. Gregory W. Tucker in ‘America’s Church’ notes that De Rosen “derived the inspiration” for the depiction from Isaiah 63:1-4 (p. 142: I would think the following verses equally relevant). Interestingly, if I am not mistaken, the ‘Man of Sorrows’ attributed to Geertgen tot Sint Jans that I mentioned earlier is also related to the imagery of His ‘treading the winepress’. With relation to the idea of juxtaposing ‘Epitaphios’ and ‘Pantocrator’, De Rosen depicted “The Entombment of Christ” ‘across town’ in the St. Joseph of Arimathea chapel in the crypt of the (Episcopalian) National Cathedral around two decades earlier. Our Lord is again muscular (though less pronouncedly), and has a more traditional ‘Cross-nimbus’: apparently lighter/brighter (by whiteness) than all the other halos in the picture, with the parts of the Cross shown being yellow/gold. An angel by the bier has fiery feet. I was planning on going to mass on Easter at the Shrine of the Immaculate Conception, but then I saw a picture of that mosaic. He looks scary. If I did not know that was supposed to be Jesus, and he did not have a halo or the wounds on his hands, I would have assumed it was a picture of Satan. I will go to church somewhere else on Easter so I don’t have to look at that frightening picture. If all pictures of Jesus looked similar to this, I would fear Him. An online book review at the Institute of Sacred Architecture relayed facts from Tucker’s “America’s Church” book that artist John De Rosen (aka – Jan Henryk de Rosen) was inspired by the great mosaic of Christ Pantocrator at Monreale Cathedral in Italy. Also, the disimilar eye treatment is actually similar to the treatment in the 6th century surviving icon of Christ Pantocrator at the St Catherine Monastery at Mt Sinai. One large, raised, and relatively severe, the other smaller, gentler, and looking somewhat askance. As noted here, there it also was about Judgement and Mercy, respectively, and the union of the Divine and Human. 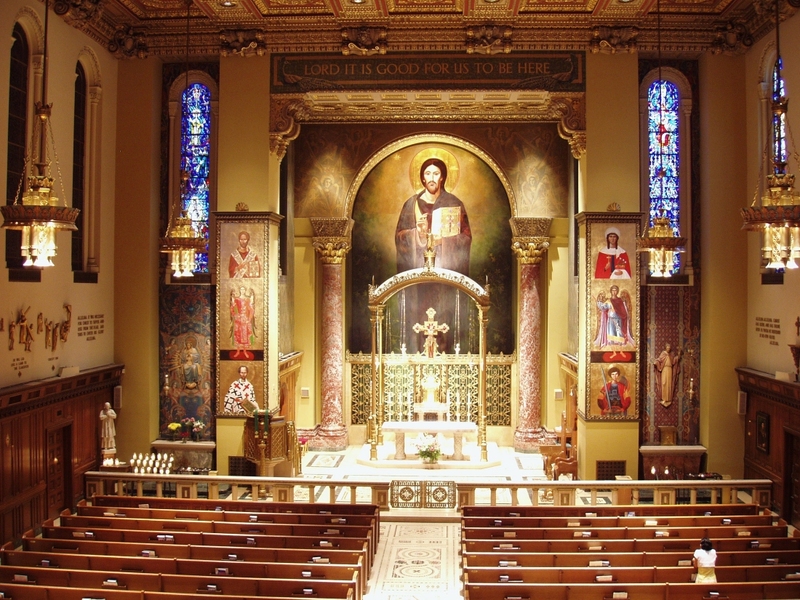 De Rosen is said to have worked on many, many churches around the world, including one in my hometown of St. Louis, the magnificent mosaic filled house of God known as the ‘New’ Cathedral of St. Louis. De Rosen and others painted the cartoons (patterns) for the designs, while St. Louis based Ravenna Mosaic Company led by father and son team Paul & Arno Heuduck were the mosaicists who executed the mosaic art itself. The Heuduck’s also created the mosaic depiction of de Rosen’s design of Christ in Majesty for the Shrine of the Immaculate Conception. There is a resemblance in visual depiction and mosaic style between de Rosen & Heuduck’s work at both. The painter/mosaicist process was similar to that of the Shrine’s new Incarnation and Redemption domes. Their cartoons were designed by Columbian painter Leandro Miguel Velasco and the mosaics themselves done by the mosaicists at Travisanutto in Italy, however yet another firm installed the work in DC and a 4th firm was general design contractor for the mosaics. Conversely, for St Louis, Heuduck and De Rosen worked together hand and glove from design to installation. Somewhere I also read de Rosen taught sacred art at CUA. True? Perhaps they have archives? Please forgive my lack of knowledge in art. This is the first time i have seen this. First impression, not sure. I noticed two things though. At first glance of the face up close it looks like there is a tear at the outside of His left eye ( the right eye as you look at it). It makes since to me. While He sits in judgement there is still a tear shed for those who have rejected him. Second, the strong build is consistant with someone that worked with wood. Christ was raised by and probable did work as a carpenter. Strong hands arms and chest are byproducts of this work. Its fitting to me but then i’m just a simple man with a simple view. I have the first $25 for the drive to raise funds for the new image of Jesus for the Shrine of the Immaculate Conception. It just has to be changed. I can’t imagine who signed off on that menacing, brooding, Teutonic figure. It is certainly not my image of God’s son and our Savior. Peace and Happy Easter. While we are on the topic. Does anyone join me in lobbying for a standardization of the date of Easter? March 23 a few years back, April 24 this year? Crazy. We use a pagan and cosmic formula for picking the date. I am pushing for the 2nd Sunday of April. Everyone OK with that? Let’s get this done in the next several hundred years, OK? I encourage people to take the church en toto. Christ in glory upstairs, the perhaps stern judge of the world, and directly below in the crypt, the Good shepherd having gone to save the lost sheep, 2 sides of Jesus personality, not unlike our own. I visited the Basilica for the first time this past Sunday. I did not have the impression that the men at Jesus’ feet were angels. I saw men in red robes. So, are the black things having off actually the ends of the wings? Then are those cloven hooves? Are we then actually looking at representations of the devil as my sister suggested to me? I meant to say hanging off, not having off. Also, there are only three, not four as stated in the article. Can you share information about the rainbow in the picture? A 5 yr old friend of mine had a dream about me night before last and a very concerned Catholic mother, who defends Obama, tells me the dream. Mom says her little girl dreamed that the three favorite people in her little world (her Father, brother & me) were standing under a rainbow with a mad face and she was frightened. She did not remember the dream when she woke up. Thanks in advance for your help and “what does evangelization look like” and what you said about joy in the midst of crisis…this is the dream the mother had about me a few years ago…she said my world was crumbling in around me and I did not seem to be upset. She thought something terrible in my life was coming…I dismissed it, but can say it comes back to me strong today as your words bring great comfort to me. I went very often to Mass at the Basilica (or, The Shrine as I knew it as before its designation as a Basilica) and as a kid I never questioned the validity of the artist’s rendering. Whether angry, confident or whatever adjective used to describe Our Lord, I always thought that the expression was truly one that Jesus would have shown. We know he is merciful, but God is equally just. We know Jesus allowed Himself to be overcome for our sake, but He is equally unyielding in His majesty. Eventually, I went to CUA and would attend Mass in the Crypt three times a week – most semesters – as my class schedule would allow. But I would always run upstairs to catch a glimpse of Our Lord in His majesty being attended to by His angels. Thank you, Msgr., very interesting explanation. The bare right side also could be to show where Christ’s side was pierced with a lance at the Crucifixion. What is the medium? for this image of Christ? Is it paint or is it mosaic? From 1963-65 I assisted Austin Purves, Jr. with design and painting of the East Apse of the Cathedral. The original paintings and cartoons were sent to Ravenna, Italy in stages where local artists and craftsmen cut tile from various sources to form the completed mosaic. The areas which I mainly worked on, were the ‘Family Group’, the ‘Ecumenical Council’ and the Soffit. Do you have a list of the members of the council that you could share with me. I lost my notes when I had to leave this position, due to my required military service from 1965-68. This image of Jesus is my favorite. He is majestic without being frightening. The depiction of Christ left me confused, and I honestly didn’t think it depicted the Christ in The Bible. He looks angry, (I heard the explanation that if you see one side it looks compassionate, but I failed to see that), his physical features seem more Scandinavian than anything else. I know The Bible doesn’t say which side was pierced by the spear but I thought his pierce on the side was on the left side…. (at least some of the commentaries of that verse made good arguments). Anyway I just felt like it was somebody else and not Christ of the Bible. I’ve read/heard that the Romans would have thrust their long-bladed spears from under the right ribs to be able to pierce the heart on the left side of the body. Especially since Christ would have been hanging above their heads, so the angles of entry would require it. What about the wound of Jesus, pierced on his side – even though there is no blood. I would also like to hear or have you include some comments from the artists. PS: Make this into a poster – for sale on the internet and at the shrine. Go to Art.com and enter “christ the king” in the search screen. You will see a poster image of the Christ that I love. Strong and serious but somehow merciful too. The face is very, very close to that which was dictated Blessed Faustina to a painter. Not that thing in DC! It is always encouraging to see the theme of judgement expressed and preserved in this unique depiction. The fact of our judgement is fading from our collective understanding of the world. As to the subject of the apse, while the many, many depictions and chapels dedicated to Our Blessed Mother are wonderful and inspiring, the aforementioned Lourdes chapel being my favorite, we cannot forget that She is the mediator of all graces. Since this is a church, more precisely a bascilica, The Host will always take center stage. The art and architecture should reflect that reality. God and His majesty are all encompassing…something that I tend to forget as I go about my everyday life. Yet, this massive work of art conveys that message to me perfectly while Christ’s stern countenance reminds me that His Day of Reckoning will come, whether I like it or not. Of course, Jesus IS all about Mercy, but Catholic doctrine also teaches me that His mercy ends the day that I die — or when Christ returns to judge us all. Do I “like” this work of art? On a warm and fuzzy level: no, not at all…but I need these types of visual reminders of the coming Judgment Day that I shouldn’t ignore. I believe it to be horrible. Mercy is the expression I hope to see on His face, not justice in this form. Not how I imagine Jesus at all. The blond hair is all wrong and the image makes me think of the wrong kind of “Luce” altogether. Not very Catholic image in any sense, no matter how much chapter and verse you quote. Previous PostPrevious Want to go on mission?